A conversation took place recently about how many art and contemporary quilters feel they aren’t accepted by their local guilds. Some even put their LQS [local quilt shop] in the mix, too. I have to say that sometimes what we art quilters do isn’t the norm and sometimes leaves others scratching their head with a quizzical look on their faces. On the flip side of that, I have that look when someone doesn’t understand what I’m doing and treats it like it is from another dimension. A few people thought some us of feel that way because we want adulation and applause for being so clever. That couldn’t be further from the truth. That’s why I’m writing this post. Whether you lean towards what we now call traditional quilting or contemporary quilting, it is really all the same. We use time honored techniques such as piecing, applique and whole cloth in our art quilts just like traditionalists do. And quite a few of the traditionalists are making quilts with fusing and raw edges just like the art quilters do. When I thought about this I imagined that the Baltimore Album quilt artist were looked at a little strangely…after all, why would you want to make a quilt pictorial? Or horror of horrors, write on your beautiful quilt with India Ink? And then later, Marie Webster developed and produced her own patterns and designs that didn’t match the pieced and whole cloth quilts others were making. Maybe some of the local quilting bee looked down their noses at these people but now those quilts are considered traditional fare, not art quilt fare. So the more things change, the more they stay the same. I think the art quilters and contemporary quilters are just a step or two ahead of the pack. Give it a few more years and just like long-arm quilting, it will all be accepted practices. If you belong to a guild and have been less than welcoming to an art or contemporary quilter, please think about what I wrote. Nobody expects everyone to do the same thing, just respect the diversity and embrace it. 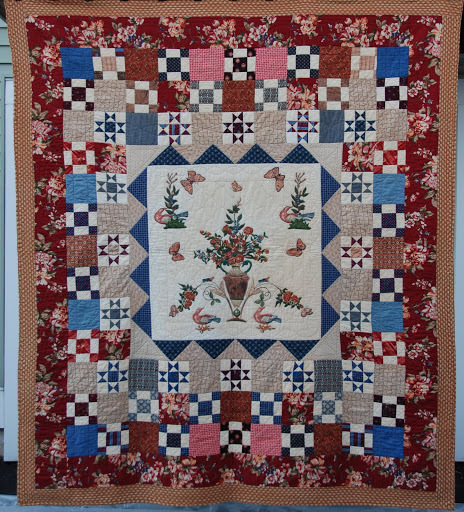 Just for fun, here is a photo of a very traditional quilt I made for a commission. I too go to a guild who appreciates the art quilts and our guild even sponsors an art quilt show at the local art center. There are a few who grumble but most love what we do. I personally like and create both art and traditional. and then there are those who think a quilt is something that lays neatly folded at the end of a bed. Why, I ask, then….do you have to add a 'hanging sleeve' to your quilt to enter a quilt show??? I put quilts on tables, on walls even on doors! I do not belong to my local quilt guild simply because of their predetermined ideas of what makes a quilt.